Fort Air Partnership (FAP), the organization that monitors the air local residents breathe, released 2019 first quarter Air Quality Health Index (AQHI) results today. The Government of Alberta calculates the AQHI using data collected at FAP’s air monitoring stations. 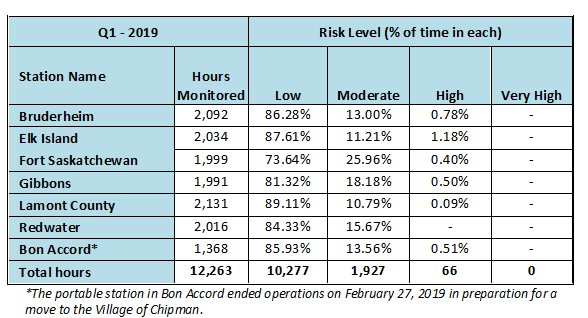 Results show air quality in and around Alberta’s Industrial Heartland was of low risk to health the majority of the time from January 1 to March 31, 2019. AQHI at FAP’s seven stations registered low risk readings at least 73% of the time, with Lamont County having the highest percentage of low risk readings and Fort Saskatchewan the lowest. Risk to health increases as the index rises. None of the stations recorded hours in the very high risk range while only 66 hours were recorded at the high risk level. The difference in results between the first quarters of 2019 and 2018 can largely be attributed to wintertime inversions seen at various times throughout the quarter. A wintertime inversion is a weather condition where cold air along with pollutants is trapped near the ground by a layer of warm air above it. During Q1, 2019 there were 19 one-hour exceedances and 20 24-hour exceedances of Alberta Ambient Air Quality Objectives (AAAQO). All of the exceedances involved Respirable Particular Matter (PM2.5). See the full summary of Q1, 2019 Air Monitoring Results. Fort Air Partnership (FAP) released its 2018 regional air quality monitoring results today along with multi-year trends showing Exceedances 2011-2018 and the Air Quality Health Index (AQHI) for the past five years. FAP operates seven stations that collect data used to calculate an hourly and forecast AQHI in and around Alberta’s Industrial Heartland. Overall, the AQHI risk to health rating in the region was significantly higher in 2018 when compared to 2017. In 2017, there were only 57 hours of high or very high risk readings. In 2018, the number was 849. The 2018 annual total was largely influenced by poor air quality conditions in August caused by wildfire smoke, predominantly coming from British Columbia. Despite the significant impact of wildfire smoke on air quality readings in August, FAP still recorded low risk readings the majority of the time in 2018. The Lamont County station had the most low risk readings at 91% of the time, while Fort Saskatchewan had the least amount of low risk readings, at 83% of the time. Risk to health increases as the index level rises. The total number of hours in 2018 that FAP collected AQHI readings increased by 31%. The addition of a portable station in Bon Accord in April, 2018 and a full year of air monitoring at FAP’s Redwater station, which began operating in November, 2017, were the reasons for this increase in monitoring hours. During 2018, there were 957 occurrences across FAP’s ten monitoring stations where air quality measurements exceeded Alberta’s Ambient Air Quality Objectives. Almost all (97%) of these exceedances were due to high concentrations of Respirable Particulate Matter (PM2.5) caused by wildfire smoke. A small number of PM2.5 exceedances were due to wintertime temperature inversions, grass fires or summertime smog. Exceedances recorded for other substances were attributed to summertime smog, local industry or wetlands.